..."We use these great products every single day, they fit very well in our program! Everyone needs at least 1!!"... 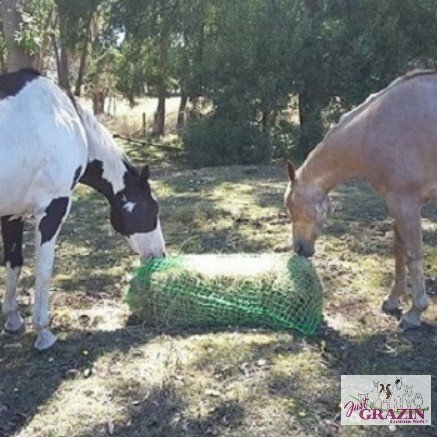 - Jo McConnel, Just Say Whoa Horsemanship *Benefits of using slow feed hay nets include - Reduce hay wastage, slowed hay consumption, simulate grazin’. Continuous slow feeding helps reduce the chance of colic, choke, stomach ulcers, decrease’s boredom and may improve stable vices. *If you require an extra long drawstring on your net, just shoot us a quick email, we’re happy to customise your net to your situation. ..."Very happy. This full bale net is awesome. Fast delivery. 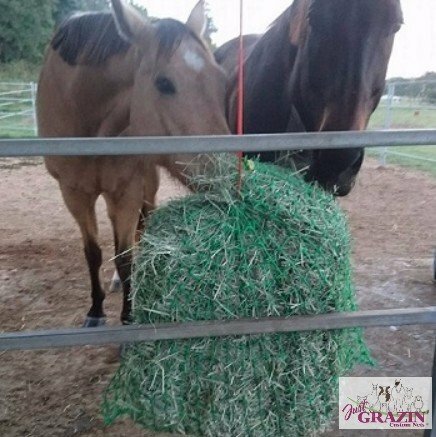 Couldnt be happier"... - Nikky S *Benefits of using slow feed hay nets include - Reduce hay wastage, slowed hay consumption, simulate grazin’. Continuous slow feeding helps reduce the chance of colic, choke, stomach ulcers, decrease’s boredom and may improve stable vices. *If you require an extra long drawstring on your net, just shoot us a quick email, we’re happy to customise your net to your situation.